Are you a graduating senior or recent grad from a theatre/acting program looking to make more of a splash in New York City? 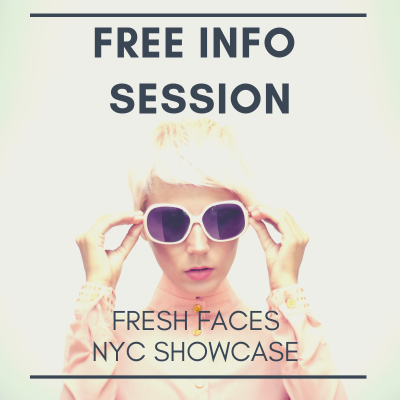 COME LEARN ABOUT OUR FRESH FACES SHOWCASE! In our FRESH FACES NYC SHOWCASE, you will showcase to 8 agencies, take intensives with 4 Casting Directors, rehearse with a professional director and learn up-to-date business practices and strategies to apply to your career ASAP-- all jam-packed into 3 days of powerhouse learning. This three day showcase event is designed to supercharge your entrance into NY, build your list of industry professionals who know your work, fine-tune your audition skill set and enhance your business acumen. The program runs 3 FULL DAYS from June 6th - June 8th and concludes with a champagne toast reception on the 8th at 9pm. Come to this FREE SEMINAR to learn more!